An herbal ointment. The herbal ointment may include about 45 weight percent of herb-infused oil, water or alcohol, or any desired combination thereof, about 30 weight percent purified water, about 10 weight percent emulsifier wax, about 5 weight percent menthol, about 3 weight percent dimethyl isosorbide, about 2 weight percent glycerin, about 2 weight percent hydrogenated methyl abietate, about 0.5 weight percent lonicera caprifolium and lonicera japanica extract, about 0.5 weight percent tocopherol, about 0.35 weight percent vanillyl butyl ether, about 0.35 weight percent xanthan gum, about 0.3 weight percent citric acid 50% aqueous solution, and about 0.25 weight percent menthyl lactate, the herb-infused oil, water or alcohol including a 1:;5 dilution of herbal extracts in a solvent, wherein the herbal extracts are of German Chamomile (Matricaria recutita), Valerian (Valeriana officinalis), Ginger (Zingiber officinale Roscoe), Peppermint (Menthapiperita), Feverfew (Tanacetum parthenium), and Lemon Balm (Melissa officinalis). We are currently awaiting the results of a methodology patent that will revolution and provide our company exclusivity in the market. Jaxsens has currently been in Wegmans for 2.5 hrs and is sold by several medical supply companies and use by several NFL and college teams. 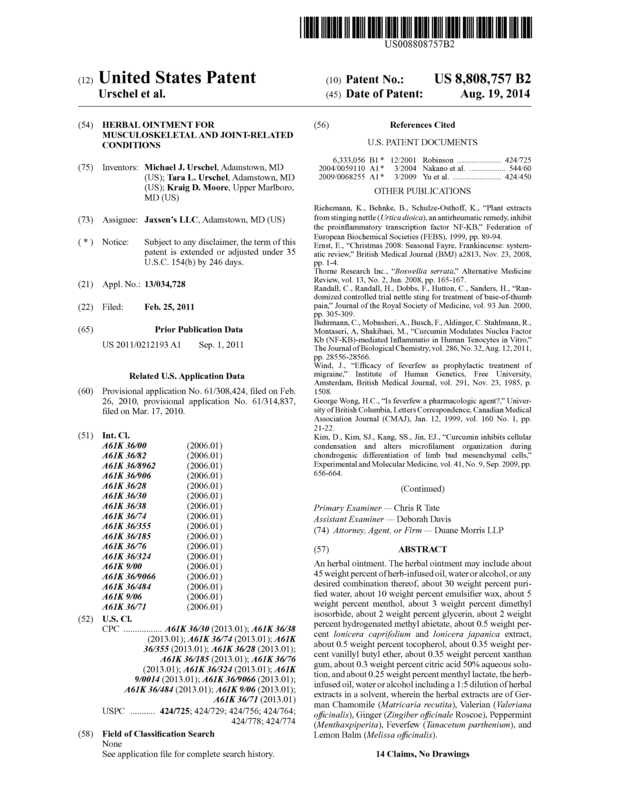 Page created at 2019-04-23 6:46:05, Patent Auction Time.